In 1958, the residence turned a new page and for 37 years became the Watson House. Richard Edward Watson and his wife Jane Stiffell Watson purchased the home from a Mr. William Beyer. Mr. Richard Watson died in 1974. Three years later Jane Watson sold the home to Mrs.Sarah Glenn Buck Watson who resided there until her death in 1995. In 1996 a young lady by the name of Catherine Parino Rue purchased the home and updated air conditioning, had the floors inspected and leveled as well as other needed maintenance. In June of 1998 the home was sold to the present owners, James and Linda Lueckenhoff who have added the above mentioned items, carport and garden wall. However, it remains for many the Watson House because of the ;Watson connection with the old Borden Ice Cream Company formerly located on the corner of Park and Ryan Street (now an ICCS parking lot). 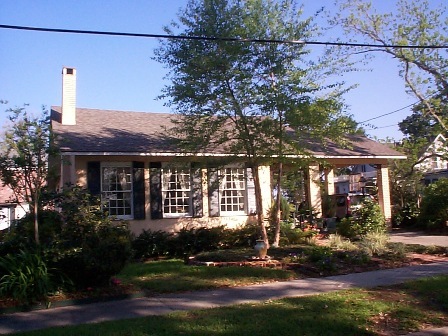 The house was a gathering place for the Watson’s family and friends. The house itself is in mint condition. The stucco is of cement which was period for that time. The twelve over twelve windows are original to the structure as well as the exterior wood work. The present owners James and Linda Lueckenhoff have added the carport as well as the garden wall and gate. The shutters are of western cedar and are operable. They replaced the original shutters after Hurricane Rita in 2005. In 2010 Mr. Lueckenhoff painted the home Pontalba Rose from the Vieux Carre palate of Sherwin-Williams. This palate of colors has approval of the French Quarter Historical Committee as an authentic replication of the French Quarter style. The trim is Tolouse Street Cream, also from the Vieux Carre palate. The accent color is a variation of New Orleans green. Thus the tradition of home and hearth at 1518 Griffith Street lives on.